Recording of a radio broadcast of a studio concert by Julian Bream in 1986. This time, it’s an archive of Julian Bream on Desert Island Discs first broadcast: Sat 09 Jul 1983 on BBC Radio 4. 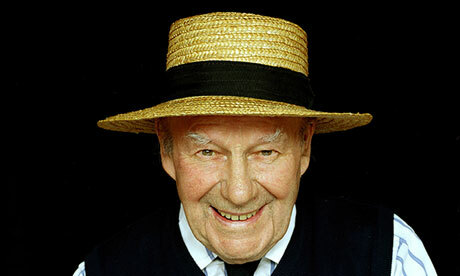 Julian Bream first played the guitar on radio in Children’s Hour when he was only 13. This led to guest appearances in a series on the Light Programme, and so his career took off. Before long he also took up the lute and played his part in the revival of interest in early music. In conversation with Roy Plomley, he talks about his long career and chooses the eight records he would take to the mythical island. Julian Bream’s eclectic choice (including Purcell, Dowland, Benny Goodman, the Beatles, Django Reinhardt and Schubert) is particularly revealing about his musical character as are his comments on the music and his early life. Another gem from the archive, well worth a half hour of your time and featuring the series creator, Roy Plomley. Importantly, there seems to be no time or geographic limit on the download. I know there has been rather a lot of Bream on telly recently (just look at the related links below), but if you live in the UK, you owe it to yourself to watch this marvellous programme if you are one of the two or three guitarists who didn’t see it tonight. The programme consisted mainly of complete performances of music played by Julian Bream on BBC TV over the last 40 years or so and shows his wide influence on the acceptance of the guitar as well as the revival of the renaissance lute. Also, his playing on live TV is magical. Highlights for me were the 3rd movement of Malcolm Arnold’s concerto conducted by the composer, the Bream consort playing Byrd, Bream and George Malcolm, Bream and Williams playing Albeniz and Bream and Yussef Allie playing Nuages. There is also a sense of a passing age seeing the two retired maestros Bream and Williams knocking the spots off most modern duos. The link to playback is still active until 31stJanuary, so go get it if you haven’t seen it already! I hope the BBC make this more widely available. Other archive programmes so far include Menuhin at the BBC and Tortelier at the BBC. Petroc Trelawney presents the last in his series exploring the great classical stars through the BBC film archive. He spotlights the legendary British guitarist Julian Bream. Now 80 years old, Bream’s life and music were richly documented through regular appearances on television from the 1960s to the 1980s. Performances include Malcolm Arnold’s Guitar Concerto conducted by the composer, duets with John Williams, hot jazz, classical transcriptions and lute music performed with Bream’s own Early Music Consort. Here is a guide to Julian Bream’s broadcast master classes recorded in 1978 in his home, featuring music by Albeniz, Villa Lobos, Bach and Britten. Available on BBC iPlayer for the whole of next year. Thank you, Auntie! This live interview is available until 31st December for those of you who can access BBC iPlayer. Fascinating the difference between this and the previous post! The legendary guitarist is announced as the winner of the Lifetime Achievement Award ahead of the star-studded ceremony at LSO St Luke’s, London, this evening. Born in London in 1933, Julian was inspired to pick up the guitar by his jazz-loving father. He’s gone on to become an advocate for lute, bringing the instrument into public consciousness, as well as the classical guitar. During his long career Bream’s devoted commitment to championing the guitar enhanced its reputation as a concert hall instrument immeasurably, and his encouragement of composers has left the repertoire so much richer, something he continues to do today thorough his Trust. Gramophone editor Martin Cullingford met him at his home to talk about his musical life and career. Two years ago Julian Bream was walking with his retriever, Django, in the fields around his Dorset home, when a neighbour’s dog knocked him to the ground, breaking both hips and injuring his left hand. For several years, Britain’s greatest virtuoso of guitar and lute had played through the pain of arthritis, but these new injuries compelled him to renounce making music seriously. He had retired in 2002 after 55 years of professional performing, but still liked to give the occasional recital at churches or halls near his home. Thus ended his longest affair, one that started when nine-year-old Julian put on one of his dad’s Quintette du Hot Club de France LPs and was seduced by what he calls the “burning anguish” of Django Reinhardt’s playing.